Sales Follow up is the biggest problem most businesses face. 48% of all salespeople never follow up and 64% of companies admit they do not have any organized way to nurture a lead. 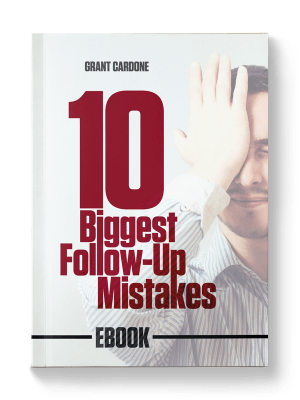 Learning follow-up methods is a game changer and a way to dominate your market. If you follow up better than the competition, you’ll win big. Keep in mind the average company takes almost 72-hours to follow up a lead and you can see why contacting a customer in the first 5 to 10 minutes increases your chances of closing the customer 900 times! In consulting with one company, my firm discovered that their industry in general struggled with the practice of following up with customers. So, we looked at what their competitors would not do and found that none of them called back clients as they left the store. This led the company to immediately initiate programs in which clients would be called back as they drove out of the parking lot. Managers then immediately started calling clients’ cell phones as they left the company’s premises and asked them to return. If the call went to voicemail, the manager left a message requesting the client to, “Please come back immediately. I have something you must see.” Or the manager would send a text suggesting that the company had something to show the client right away. If there was no successful contact made, another manager repeated the callback program the same day and again the next morning. Almost 50% of the clients returned immediately, and almost 80% of those became buyers at that time. Another 20% returned as a result of the later calls and increased the sales of that organization to new levels. Don’t feel bad if you aren’t doing a great job of follow up. The reality is none of us were taught creative ways to follow up. Beyond a manager just saying, “follow up” over and over—there has been very little instruction on the topic. Some companies have surrendered to the idea that their people will not follow up and pay other companies to send cookies and mail. I have invested the time in creative follow up ideas, calls, scripts, and strategies for sold and unsold customers and put them all on video so your sales team can know what to do and say on day one, two, three and through a full 365 days! In many ways, the follow-up call can be more challenging than the cold call, and nobody wants to do the cold call. The follow-up call is even more challenging than contacting someone who you don’t even know. But it’s the follow-up call that really gets a sales cycle rolling. 73% in business-to-business prospects are not sales-ready, and from that 50 % are not ready to buy. Nearly 65% of people don’t nurture leads, and for the 35% of salespeople that want to be game changers and actually are trying to nurture leads, follow-up is often more difficult than a cold call. The client showed interest and now they don’t. How do you get them re-interested? You have to build your credibility, show and prove your commitment to your product or service and ensure you remain at the forefront of the buyers’ perception using all three primary types of follow-up methods. The number one preferred way to follow up is texting. It’s preferred because it’s so easy and so fast. If you’re going to have one contact, the cell phone is it. It can be a piece of information, a photo—just ask where you could text the data to. Another move is to just ask to take a picture of them with the product and then send it. I’ve never had a customer deny me a photo of me and them on their phone that they could text back to myself. Try texting data during the sale. When someone is requesting data from you and you text them during the sale the chance of converting them goes up 300%. The cell phone has proven to be the number one tool when following up a potential customer. Make it a priority— your primary focus should be on the text. This is one of my least preferred ways of follow up but it’s still necessary. People think they follow up because they sent an email. Look, if the email didn’t get to them, you didn’t send it. Remember that saying about when a tree falls in the forest and nobody is there—did it make a sound? If you send an email and it goes to spam, nothing happened. Nobody heard anything, the message wasn’t completed, there was no communication, and therefore there was no follow up. I hate emails. You know why? Because I don’t know for sure if they got them which means I’m left in doubt. The reason I follow up is so I can come out of doubt. Emails are also forgotten very quickly. They get lost. Today I got maybe 60.
Who texts me? My friends do. People that are close to me. That’s why in an email you need to embed a call to action and a phone number. That number should be your cell, not your office number. This is a huge mistake many people make. People don’t make a call to action, the text is too long, no promises, no big claims, and there is never a cell phone. Although email is weak, it’s lazy, but you still should be doing it. This is one of my most preferred ways to follow up. I go through all the same doubts that you do—am I being too persistent, will they answer, will they tell me not to call anymore, or will they deny me? I go through all that—but at least I know I’m talking to someone. If I talk to enough people, I’ll sell something. Where do you call? Call cell first, then office, then home. Who do you call? Everybody. When I make a call, I actually make 6 or 8 phone calls. When I call a company and ask for Bob and Bob’s not there, I ask for his voicemail. I leave a message and then call the receptionist again and ask who is underneath Bob. Then I go back to the receptionist and ask for who is under Jack. Shelly is. I call her and she finally picks up. It’s the first contact of the day. You see, I don’t just leave messages, I always talk to somebody. Remember to always have a specific reason for calling. Start with “The reason I’m calling is…”. Also, keep it tight—people don’t have all day. Pound the phone, use email, and text. It’s a three-pronged attack that are the basic building blocks of follow-up. Don’t just use one or two—use all three. Unreasonable means without reason. Keep pushing because you believe in your product, in your company and your service. I’ll be unreasonable even if you don’t like me calling you on a Thursday afternoon after I’ve already called you 10 times, texted you four times and sent two handwritten letters. I’m going to be unreasonable. I get this all the time, “Grant, don’t call me again.” I say “OK, you got it, it won’t happen again.” but the next day I’m going to find a reason to follow them up. That requires me to be unreasonable. If someone attacked you with a gun, would you be unreasonable or would you make sense of that gun? If a bomb went off in your building, you would be unreasonable and do whatever it takes to protect yourself, your business and your family? Figure out a creative way to follow up. Your commitment must be so unreasonable that you keep popping up with ideas on how to follow up even long after a client has said not to call again. I called a guy 15 times in three days, 5 five times each day. He didn’t call me back once. The definition of follow-up is seeing something through—all the way through. Should I call 15 times and quit? That’s what you do. The average salesperson calls back twice and bails. Don’t be that guy. Follow up until one of you dies. Before we dated, it took me 13 months to get my future wife to go out with me. I told her later it’s not stalking if it works. You need to become an all-star at following up with your customers. I love this follow-up. It could be a piece of mail, a text, an email or even a mention in a tweet. This is a great one when reading an interesting article, blog or post. The only reason I read the news is to use that information to follow up my customers. I tune into Business Insider, CNN, CNBC, Fox, any station, in order to follow people up. If I go to an exhibition or trade show, I’m collecting data there. I want to follow people up with links and ideas, and a great way to do that is, “I saw this car” or “I saw this product” or “I saw this book” and I “thought of you”. Notice that I didn’t send the person the book, I took a picture of the book. I didn’t invest in the book yet. If he says yes, he likes books, then I can send it. It’s simple, easy and effective. This is the client you’ve been following up for six, seven, maybe eighteen months. You need to pull out all the stops here. If you don’t think it’s professional, let me tell you what’s not professional—not doing whatever it takes to earn their business. Pull out all the stops, be memorable and stay at the front of their mind. Everyone wants to be on the front of a magazine, so Photoshop their image on GQ, Fortune—any major recognized name—with them on the cover. It’s a smart way to get back in front of a client. If you don’t have the technical skills to do it yourself, you can easily google search and pay a small price for someone to do it for you. I really was in this magazine, no photoshop! I’m going retro, bringing back the 30’s to the 21st century. Before you discount this like everyone has around me, people use telegrams every day. You can have a telegram sent to your client and it will be the first telegram they’ve ever received. The only time they’ve seen it is when they have watched black-and-white movies from World War II. Try the telegram. The inability to get past gatekeepers is a big problem for many people. I’ve been asked for 30 years how to get past these filters. You have to be creative. You have to love gatekeepers—not hate them. If you hate on a gatekeeper, you’ll always be on the outside. You need to think like they think. They were given a task to protect their boss from people getting to them. You want to treat the gatekeeper like a million bucks. Most people treat the gatekeeper like they don’t exist, but the more the gatekeeper likes you the better off you’ll be. They have the keys to the deal. Send gifts. Tell them you appreciate them—pour it on. They have the keys to the gate! Use a newsletter or blog. They are great ways for you to stay in touch, establish, justify, and bring credibility to your brand. What do you do in a newsletter? It’s not about selling your product, even though you can do a little bit of that, the purpose of a newsletter or blog is to be first in your buyer’s mind. That means you have to give data. I want to remind people who I am, what I do and give data. Keep dripping and keep paying attention to them. Newsletters should be filled with helpful information. Whether in person or on the phone, on the first day start thinking about how you can move an individual to a no. “Hey, could you agree to move up this order date?” They’ll respond, “What do you mean I said I’m not doing this?” You respond with, “I know, the reason I’m calling is I just want to see if there’s any possibility, any chance of you moving up the order date”. They’ll say “No”. Boom, you got no #1. The thing to remember here is that you are in conversation and communication. “Would you agree to take out the time in your decision making, assuming I can handle all other issues that you’ve mentioned?” Here I’m asking for the second no. “For your budget considerations of your next quarter, could we move up the schedule, if I could figure out how to delay the payment schedule?” Again I’m looking for a third no. Your question might be put another way—these are just examples. “Look, I really know how much your company is going to benefit from this product, this service, and that’s why I continue to persist with you. Can we do this? Can I get you to change your mind on this?” I’m looking for a fourth no. “You’ve told me how you can’t do this, let me ask you how could you make it work?” This is the fifth no. Now the next call is where the flip is, where management makes a call for you to find out from this customer why they have not bought. At that point just listen, the manager should not try and close, although a close may present itself. If you want to really max-out the income opportunities in your career, you must make sure that you stay interested in your customer, no matter the outcome. This is a big mistake that we have all made when we don’t follow up enough on those people that are not immediate sales or maybe even with those customers that we were not successful in selling. Remember people are more concerned and interested in themselves, their families, their businesses and their lives than they are in your products, plans and programs. It is vital that you continue to stay in touch with people and show interest in them throughout the year, not just when they are shopping or buying. If you do this persistently, it will sprout green in the future. Look, you can’t expect to make a withdrawal from your bank account if you haven’t made the right number and size of deposits over time. Technology can make this so much easier today. You can send emails, text messages, a tweet mentioning a client or others to follow, a post about a prospect’s company on your facebook page, a personal visit, or even a short video. 63% of people requesting information on your product will not purchase for 3 months. That means for 2/3 of your clients you need to be paying attention to you for 90 days. 20% won’t buy for more than a year. 83% of people are not buying anything for somewhere between 90 days and 12 months. Some of the most loyal customers I’ve had took the longest to get. It’s vital to have superb follow-up, to have strategies, tactics, and a schedule to close customers later who you don’t close today. With repetitive follow up you will learn things you wouldn’t with minimal follow-up, like that the “decision maker” you’ve been talking to isn’t actually the decision maker. When I was 27 I was in a company and didn’t have any executive power, but I was the shot caller. If you could get to me I could get it done. Most vendors had no idea I was the most influential person in the company. The point is, proper follow up can show you who the real influencers are and give you monster numbers of new sales. The purpose of the follow up is to demonstrate INTEREST in this person and those things that are important to them. You must be creative to stay INTERESTED. Great sales people are creative, not at selling, but as entrepreneurs. Look for creative solutions to show interest in your clients. Technology like CRM’s, e-calendars, automated reminders or an old fashion day timer will not make you great at follow up. That takes dedication and motivation on your part. Creative follow up only comes after a commitment to making investments in staying interested in people. Then you must be consistent (not sporadic) and most importantly persist over a long duration until the person you are taking interest in actually becomes touched at your genuine interest in them. This will forever separate you from the rest of the field. I talk about these sales concepts and more in my bestselling books, which you can get for free. Most all salespeople neglect staying interested in their clientele and they pay the price when they finally get in front of the neglected customer. Persistent contact, for example, 12 contacts over a six-month period of time, will make the next sale more possible and more profitable. Once I was bidding on a large apartment complex in Tampa, Florida. The real estate group and seller awarded the deal to another buyer and the agent’s firm didn’t even take the time to call and inform me. Does this group think I was only interested in their product and will never buy another apartment building? Or maybe their business is so good right now that they can afford to ignore me as a potential buyer? The reality is, he had more buyers looking for apartment product than he could fulfill. This guy must have thought that the good times will last forever when we all know it will not. The real professional business person isn’t just a salesman and knows and plans for the inevitable cycles that occur in sales. The real pro KNOWS the fastest ways to separate one’s self from the rest of the field is through creative, consistent and persistent follow up. Interesting this problem with follow up isn’t just confined to Tampa. I once bought 242 units in Austin, Texas. The broker that sold me the property never even called me back to thank me or to see if I was interested in other product. It’s beyond hilarious to me. On top of that, the person that provided me with the Fannie Mae loan, who did an unbelievable job for me, did follow up but not creatively, consistently and with persistence over a period of time. Since closing on that deal, I have sold the Austin property, using a different broker, and I have bought or have under contract many more units. The original real estate broker could have earned a commission on me buying the property and then selling it for me 6 months later but he didn’t. The lender could have provided me with funding on six more deals since that time. CRAZY! Your future in your business will be determined by your ability and willingness to be creative, consistent and persistent in staying interested in your customers through FOLLOW UP. Every contact is greasing the line, lubricating the relationship, separating yourself from all the other players and demonstrating to your customer that you are there for them all the time, not just when its time to close the deal. I assure you that by being creative, consistent and persistent in staying interested and following up with customers you sell, as well as those you don’t sell, will improve your self-esteem, improve your closing ratios, increase your sales and is the number one ingredient to improving your profits and margins. A handful of follow up calls or emails means nothing to most of your clients and will only feel ‘salesy’ to them. It is only when you get very creative on a consistent basis and then persist over time that you will start to see the relationship become something more than just a contact, lead or opportunity. If you want to have specific motivation and examples of great ways to follow up check out Cardone University. Everyone knows follow up is important, but most people never do enough of it to make a difference and then start thinking follow up doesn’t work. And they are right, follow up does NOT work until you are able to get creative, consistent and persistent over long periods of time. And remember no piece of technology, CRM or call center can do this for you. It is completely up to you. Thanks for the article. My follow up needs to increase 10 fold. Well, Mr Cardone, you sure have taught some great gems for Sales productivity and customer relationship building. Advanced tips are super-useful, thanks!